It’s not just a chip you’re purchasing… it’s a key to unlock world-class performance tuning. Every chip comes with FREE access to our entire library of calibrations for stock trucks. You choose what power levels you load onto your chip. Our easy to use HydraFlash software gives you full control. Need custom tunes for your modifications? No problem. Choose from many Hydra tuners across the country. Everything is done through email, so you never have to send your chip off to be programmed. The Hydra chip always has  bypass mode and [NS] no start built in. There are 15 more positions you can program from our database, custom tuner of your choice, or your own files you develop in Minotaur software. The choice is always yours. Optional USB extension cable for programming in-truck – never pull your chip for programming again! 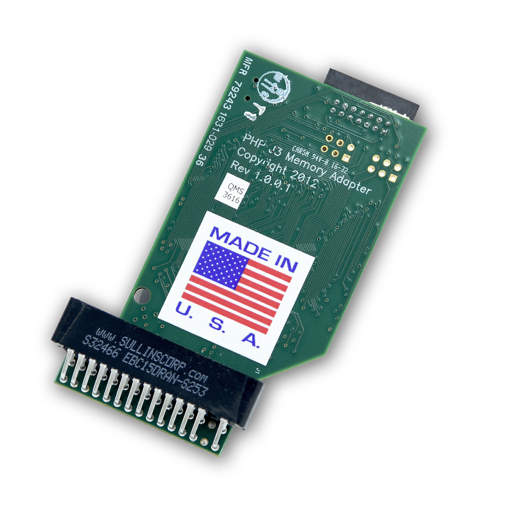 Made in America: Wherever possible, every part of the Hydra Chip is sourced in the United States. The boards and ribbon cables are made in Florida, the switch case comes from New York, the switch decal is made in Washington, the boxes come from California, and the whole thing is assembled in Georgia. There are individual components that are only available oversees, but we put tremendous effort and pride in finding all the US sources we possibly can. We believe in promoting American jobs for the strength of our country. Ideal for PTO operation or for faster warm-ups. We do not recommend exceeding 1,200rpm for safety reasons. *Due to injector size, stock 1994 to 1997 trucks will only have calibrations available up to 80HP. Early 1999 can go up to 100HP. Late 2001 to 2003 PSDs cannot use the 140X tune because they have Powdered Metal Rods. 1994 to 1997 and early 1999 Power Stroke and International trucks are fitted with smaller volume injectors than the late 1999 and up Super Duty trucks, and as such are limited to increases of about 65 HP for the 1994 to 1997 and 100 HP for the early 1999. Some trucks, depending on tolerances, may be able to utilize up to 80 HP and 120 HP respectively, but we cannot guarantee that the power gains will be achieved. Great Customer Service and Absolutely Killer Chip! Can't say enough good stuff about my experiences with PHP! Their email responses (Dylan is who I worked with) were prompt and answered all of my questions clearly and directly. Once I received my Hydra Chip and Opened it up I was impressed with the presentation of everything in the box. Installation of the Hydra Chip is very straight forward and simple (Just make sure to get enough of the silicone off of the PCM and don't clean the contacts all of the way down to copper!). My Box/Hex Code for my truck was not in their software so I shot an email over to Dylan since on the Hydra help page it says they will recommend another Box/Hex code for your truck, which he did very quickly. Programming the chip is very easy with minimal confusion. My truck is basically stock with only an upgraded 3" downpipe and 4" straight pipe exhaust and holy cow did these tunes wake it up! I figured it would come to life a little bit but not nearly as much as it did! On the 80hp performance tune my truck will chirp 4th! ESSENTIALLY STOCK! I can't wait to start doing more power mods to the truck and get some custom tunes in there. My only complaint is that the ribbon cable that goes from the chip to the display could be about a foot longer, but by no means would that stop me from buying another one. 5 out of 5 for everyone over at PHP, they have another very satisfied customer who will be coming back for more products! Night and day difference coming from the edge evo. The Hydra has a lot smoother power over a wider rpm range, lower egt's and less smoke for the same horsepower tune. So far I've tried tunes for the original hex file for my truck and the recommended hex file and I like the older tunes better, the trans shifts firmer, they feel like they have more power and lower egt's at w.o.t. cruising egt's and pulling hills at part throttle are about the same between the two. The one thing I like about the newer tunes though is the converter doesn't unlock on down shifts. I have had multiple 7.3s, I put larger I hectors in my truck and she ran rough!! I put the hydra chip on with power hungry get tunes and man has my truck come alive!! And what's awesome is when I do the fuel system or the trans next I can just plug my computer in and BAM new tunes! This chip and the es saved my truck. I could not be happier (unless it also gave me like 30mpg).